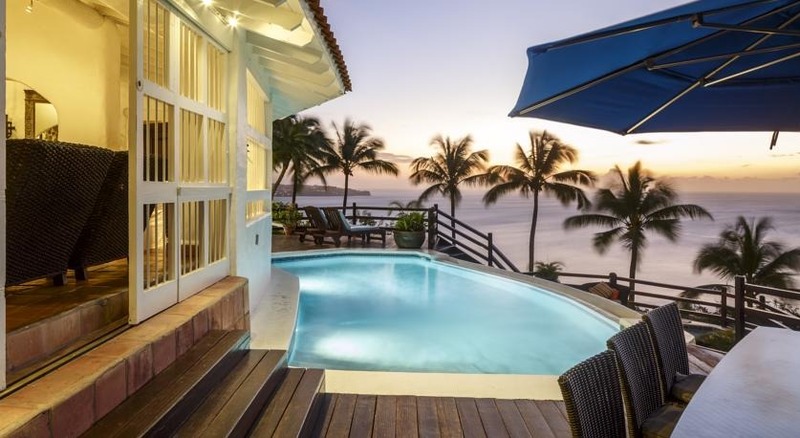 Many guest rooms at Windjammer Landing Villa Beach Resort have their own private plunge pool. Located on the north shore of St. Lucia, Windjammer Landing Villa Beach Resort overlooks the crystal-clear Caribbean Sea and boasts landscaped gardens and waterfalls, six pools and a luxury spa. The resort offers an all-inclusive option that includes unlimited food and beverage (except wine and sparkling wine by the bottle), motorized and non-motorized water sports, and wellness classes. The Windjammer’s air-conditioned rooms and villas feature free high-speed internet, cable TV, a mini-fridge and tea/coffee making facilities. Bathrooms include hair dryers and free toiletries. Some of the fully equipped villas offer a private pool. The Serenity spa features a private pool area, steam room and treatment room overlooking tropical gardens. Treatments include aromatherapy, massages, body wraps and facials. The resort also has a hot tub and a gym. Casual and formal à la carte dining are offered at this St. Lucia villa resort. There are five restaurants and four bars to choose from. The Windjammer’s Jacquot Fun Club offers supervised activities and theme nights for children from four to 12 years old. Teenagers can enjoy bonfire nights, karaoke and water sports in the Teen Club. Fly into Hewanorra International Airport (UVF), St. Lucia. The resort is located about 80 minutes from the airport. Transfers are available for an additional fee. Visit Windjammer Landing Villa Beach Resort’s website for more information.